Conchita Wurst, he or she who won Eurosong 2014, with the presentation as a bearded woman, to many people, has left mixed feelings, and numerous controversies. It seems as if this phenomenon has left impressions with charming presenter, Roza Lati, who has decided to try herself as such woman. 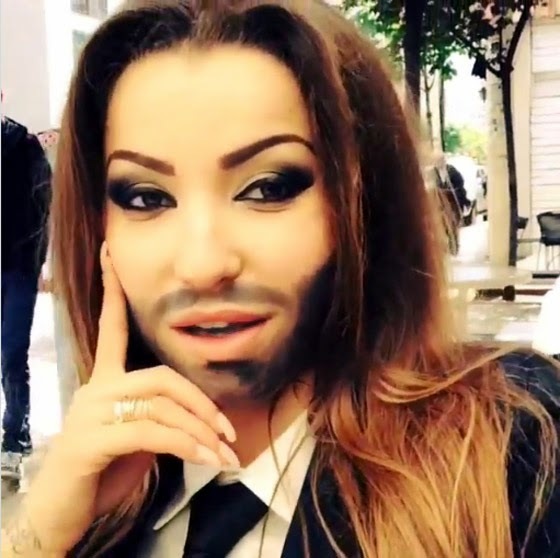 Conchita's beard brought huge luck to her in Eurovision, while we waiting to see what will this beard bring to Roza, apart from big laughter by fans. Roza Lati ben "femren me mjeker"
Conchita Wurst, ai apo ajo qe fitoi Eurosongun 2014, me paraqitjen si nje femer me mjeker, tek shume njerez, ka lene ndjesi te perziera dhe polemika te shumta. Duket sikur ky fenomen i ka lene mbresa edhe prezantueses simpatike, Roza Lati, e cila ka vendosur ta provoj veten si nje femer e tille. Conchites mjekra i solli shume fat ne Eurosong, ndersa presim te shohim se cfare do i sjell Rozes mjekra e saj, pervec te qeshurave te shumta nga fansat.